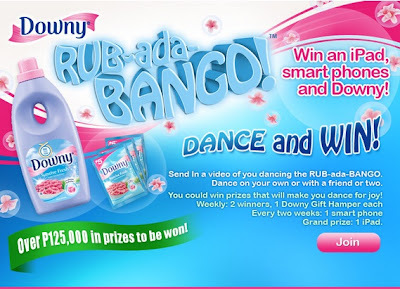 Downy Do the RUB-ada-BANGO ~ Philippine Freebies, Promos, Contests and MORE! It's time to have fun and do the Downy's RUB-ada-BANGO dance craze. Download the mp3 music and create your own video version of the dance. Have fun with it! RUB-ada-BANGO on your own, with a partner, or with a group. If you're not into dancing, then join the I Rub You! meme. Simply upload a cleverly captioned photo showing the many ways you rub. Prizes at stake for the RUB-ada-BANGO dance video are Downy Gift Hampers worth P1,000 each (Weekly), Smart Phone worth P6,000 (every 2 weeks) and iPad3 64Gb worth P35,300 (Grand Prize). Downy Gift Hampers worth P1,000 each will also be given away to the weekly winners of I Rub You! meme.